← Last Call For Flash Fiction Entries! Nothing was motivating me for several weeks. Nothing original was coming, and the idea of meditative Zentangling just made me more anxious. Couldn’t write, either. All I did was reblog a few posts I thought followers would be interested in reading. Clearly, I was in a full creative block with no doors or cracks to let inspiration in. Time to step back and do some rote or non-creative directed work. 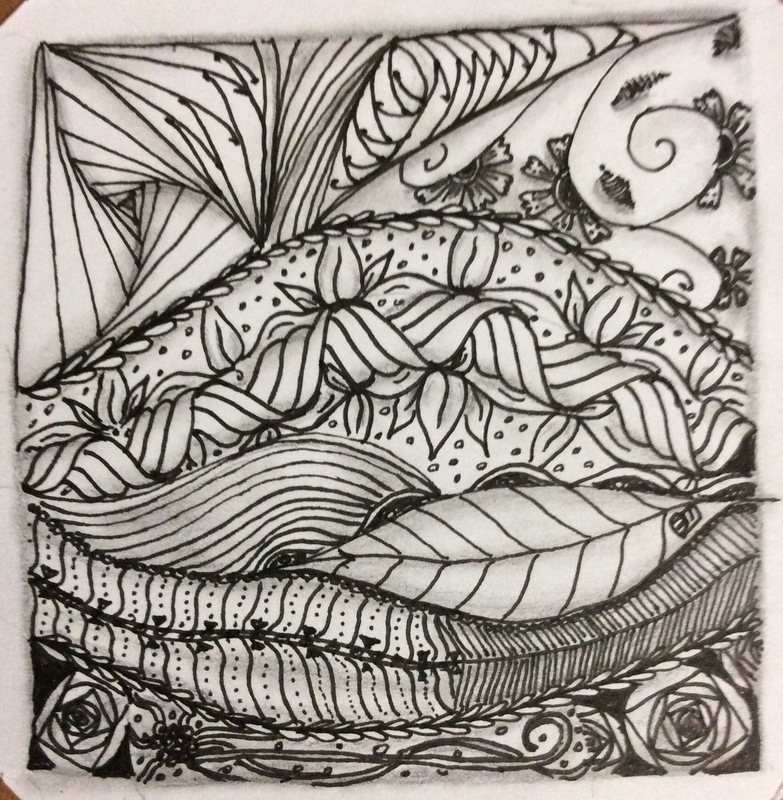 Yesterday afternoon, I created my first Zentangle tile in a while. For whatever reason, I felt the need to get into a meditative state. And so, I tangled. I started with a re-creation of a string from TanglePatterns.com–string #231, to be precise. The tangling took over, and I found myself in the groove. Before I knew it, the design had added a new string section within the original string, and the work just flowed. I ended up working on it for an hour and a half, without getting tired or bored. Sure, I had to sit back a few times and think about what to do next; but not for long. The Micron pen seemed to know what was needed, and glided along the tile surface. Here’s the thing: I encountered a creative block. Doing nothing was no help. Learning something new stimulated ideas, even though I was not after motivation at the time. For me, the key seemed to be staying within an area that was blocked, but learning a new aspect of it instead of trying to create something new. While crocheting something new to me, thoughts of how the crochet motifs could be used in Zentangling came to mind, especially when the directions were so complex for a pattern section that should have been very easy. The conscious act of redefining the directions also gave me some tangling ideas. In the same time interval, learning new tangle patterns set my creativity free to run around collecting new information. When the creative part of my mind returned, inspiration came along for the ride. Interestingly, I still have no inspiration–as opposed to motivation–for writing; but then, I didn’t practice any writing or try to create a poem, either. Perhaps if I try to learn a new writing technique, or try to mimic an author I am currently reading, or generate single sentences around a word or phrase, I will find a new story idea. 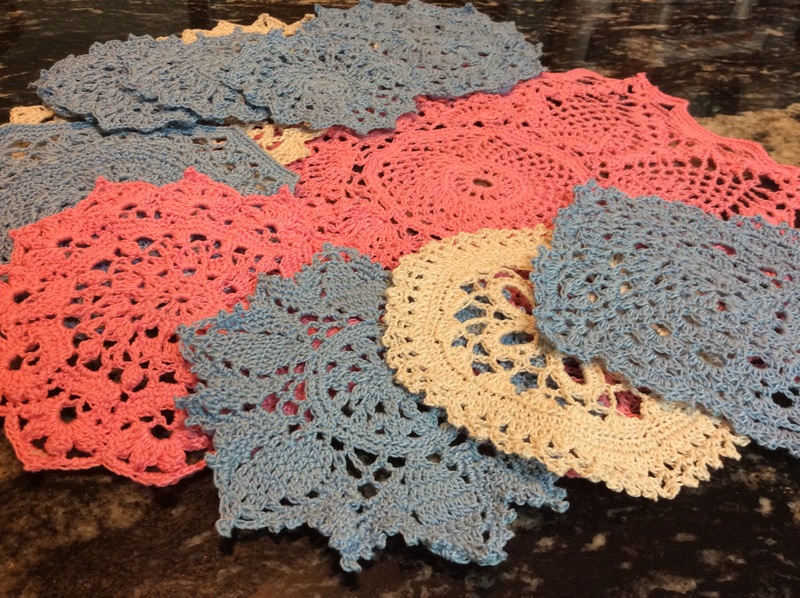 The crocheting and tangling are loosely related to each other, as they both form visual patterns. The visual element didn’t cross over into the writing, even though I tend toward visual learning. So I need to find some way to stimulate the verbal aspect–maybe do some crossword puzzles, for example–since writing prompts are not doing it for me. Learning seems to be both my motivator and the means to inspiration. For now, I am happy to have found a way to break the creative block in one art form, Zentangling. Next, I will look for ways to get the writing process stimulated. Just writing this post is a start. This entry was posted in Art, Writing process and tagged inspiration, Learning, Motivation, patterns, Writing, Zentangle. Bookmark the permalink. Very intriguing. I will have to look into zentangling since never heard of it. Reading others’ blog posts, practicing on my guitar, watching news and documentaries, and my dreams often stir my thoughts to write. Thanks for sharing as it is interesting to learn how others get from point A to point B. Blessings. thanks Ellie for this very interesting post. i find having a weekly feedback writing group to be a great motivator to produce new work. i like your crochet doillies. i’ve returned to crocheting myself recently. made some fabulous fingerless mittens. am looking for ideas for small things to make. i’m glad that zentangling is such a wonderful creative outlet for you. working on small manageable creative projects is the way to go. another idea is to go deeper into describing how it feels to be blocked. we can all relate.